How cheap will Xbox One X be over Black Friday? Until now Microsoft’s 4K console has been very expensive. The benefits of upgrading from the regular Xbox One S have been relatively slight, largely because the S manages to play 4K Blu-rays and displays HDR. Sure, the increased power of the Xbox One X is a big deal, as is the added HDD size and the fact it can render proper 4K (ahem, unlike some other consoles) without resorting to ‘checkerboarding’. But is it really worth spending another $500 / £430 for a console that offers 4K gaming? Perhaps not, but that’s all about to change. The big old headline from this year’s XO18 event is that the Xbox One X is getting a price drop from November 18-26, meaning you’ll get $100 off EVERY console. So, the basic retail price will be $399. That’s a big deal. Suddenly, Xbox One X is very much on a par with PS4 Pro in terms of price. This throws off a lot of previous predictions about how cheap you’ll be able to buy the Xbox One X. However, given previous Black Friday Xbox One deals, we can still get a good idea of how much lower it’ll go. To get an idea about the X, we first need to look at the S. The Xbox One S will hit $200 / £190 with a good game this year (we’ve already seen sites like NewEgg previewing deals that put the console at this price), and that’s a damn good deal for such a versatile console. If you see an S with a game like Assassin’s Creed Odyssey or Shadow of the Tomb Raider for $200 / £190, you should really consider picking one up. The S is currently $299 with a game, so that’s a saving of about 30%. We saw similar savings on the S last year, although these deals are slightly better in 2018. So, what about the X? Well, Microsoft’s price-cut already represents a saving of 25%, and the fact that the console is much newer and more in demand than the S will likely mean any additional savings are slight. However, retailers love to undercut each other. While most will do so by bundling in extra games, someone like Amazon.com will likely lower the price even further. Expect about a $10-20 saving on that new $399 price, meaning you’ll be able to pick up an Xbox One X on its own for about $380. Probably. What’s more likely is that you’ll see Xbox One X deals including 2-3 games, for slightly more than $400. A typical bundle will probably be Xbox One X + Forza Horizon 4, Forza 7, and maybe Sea of Thieves for about $420. That’s well worth a look, especially if you’re buying the console new, having never owned an Xbox One previously, because it automatically gives you three of the best games on the ‘box. Other bundles will be variations on that theme, but we’ve seen a hell of a lot of Xbox One X packs with both the newest Forza games and something else. The best Xbox One X bundles during Black Friday will, then, undoubtedly be the newly announced Battlefield 5 and Fallout 76 bundles. These were $499 to start with, but they’ll be $399 during the week of November 18-26, so what you’re getting is a new console and a brand new game for 25% less than you’d pay right now. Which is huge. If you were to buy an X and Battlefield 5 today, separately, it’d cost you $560. Ok, that’s a dumb way of doing things, but it shows you just how massive the savings will be over Black Friday. What about the UK? Normally, we’d expect to see prices fall in-line with the US, and that’s certainly the case for the S. However, it’s unclear whether or not we’ll see Microsoft’s massive 25% price drop replicated in the UK, which would mean the emphasis is on retailers to lower the price of the X. This will inevitably mean that the X is way more expensive in the UK, because shops just won’t discount the console by that much. We’ve reached out to Microsoft to discover whether or not the UK will see a similar deal to the US, and will update this article once we’ve had a reply. So, what games should you expect to get cheap this Black Friday for Xbox One X? Forza Horizon 4 will be cut to $35 / £30 in most places (Target has already confirmed this deal) and you should expect to see Assassin’s Creed Odyssey in most bundles. Shadow of the Tomb Raider will also be going very cheap too, and you’ll likely be able to get hold of a second controller with some deals too. Very handy. Overall, it’s brilliant news for US buyers. The Xbox One X will not only be the most powerful console in the world, but it’ll be a great price too AND will likely come bundled with some top games. The S will be an incredible price too, if you’re not worried about 4K gaming and just want a console to maybe buy Xbox Game Pass for. The deals will be better than the ones we’ll see on Sony’s rival PS4 Pro. All this is in the US. The rest of the world, especially the UK, will be waiting to see whether or not they get similar deals from Microsoft itself. 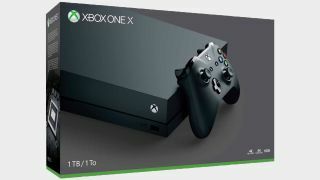 If the House of Xbox is feeling generous, the X will be the hottest console this Black Friday, so if you’re thinking of picking one up now really is the time. Save that November 18-26 date, and ready the bank balance for a battering.